Back again for day three of Lawn Fawn Inspiration Week. Today we are featuring the sweet set Home Sweet Home and matching Lawn Cuts. I just love the images in this set, the sweet little birds and the houses are just too cute! 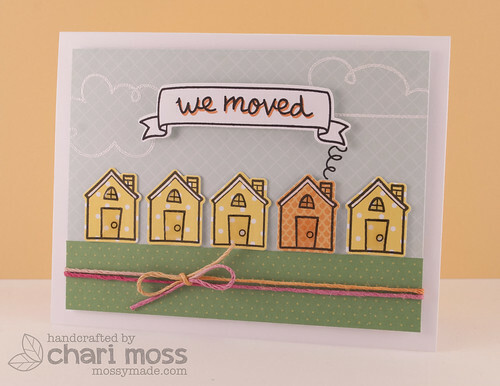 For this card I stamped and die cut one of the house images to create a row of houses for a We Moved card. I used papers from both Daphne's Closet and Pink Lemonade petite paper pads. I white embossed the clouds from Bon Voyage for the sky and finished it off with some Pink Lemonade Lawn Trimmings. Check out the Lawn Fawn Blog for more fabulous design team projects using this sweet little set. Oh and as always I'm sure there is a giveaway there as well! All I am struck with is how purely and absolutely talented you DT gals are!!!! What a great idea to do this and skip the birds (even though they are WICKEDLY cute)..... but this is a great, great idea. Like having a whole different set! Just the sweetest ever...love your cards!!! Such a sweet card, Chari...I love it! I love the row of houses and the cute sentiment banner!